Associate Professor Knight teaches strategy from a design thinking perspective in the undergraduate and postgraduate curriculum, and leads the capstone course of the University of Sydney Business School MBA program. His novel approach to research and teaching, known as Design Strategy, have resulted in commercially funded partnerships with Swiss Re, Optus-Singtel, and uBank. He has been awarded the Dean’s Citation for Outstanding Teaching several times and is currently supervising several PhD students. Eric’s service includes membership of Academic Board and the UE Research Committee at the University of Sydney. He is a Rep-at-Large in the Strategy Practice interest group of the Strategic Management Society. As well as contributing to several industry-embedded research networks, he serves as a company director on two technology-led ventures. He is a Graduate of the Australian Institute of Company Directors. 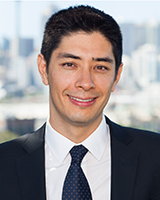 Prior to academia, he worked for several years with the Boston Consulting Group for industry and government clients in Australia and Asia. Developing new theory on how change is communicated in strategic management. This is specifically focused on the novel use of visual materials within organizations, as well as how communicative practices are used to overcome breakdowns of interpretation and paradoxical tensions. This includes the novel use of ‘Design Strategy’ – a strategy tool in which design thinking informs strategy making to enable faster, more inclusive decision making. This research has implications for strategy participation and inclusion, especially for marginalized voices in the strategizing process. Investigating the nature of regional innovation and the development of ‘clusters’. This is specifically focused on how space is created to allow collaboration between organizations, industry, government, and other stakeholders to formulate and implement strategic initiatives. This research has implications for the design of smart cities and well-connected, productive regions. Knight E, and Paroutis S (2019) How Visual Methods can Enhance our Understanding of Strategy and Management Research Methodology in Strategy and Management; Emerald Group Publishing Limited, Bingley UK. Paroutis S, and Knight E (2019) Visuals in Open Strategy Cambridge Handbook of Open Strategy; Cambridge University Press, Cambridge, UK. Hahn T, and Knight E (2018) The nature of organizational paradox: a view from quantum theory 78th Annual Meeting of the Academy of Management (Aom 2018); Academy of Management, Chicago, USA. Knight E, and Wojcik D (2018) Financial technology (FinTech) and the spatial economy 5th Global Conference on Economic Geography (GCEG 2018); University of Cologne, Cologne, Germany. Knight E, Grimes M, and Gehman J (2018) Pivoting in action: how repositioning successive change as scientific revision enables managerial discretion 78th Annual Meeting of the Academy of Management (Aom 2018); Academy of Management, Chicago, USA. Knight E (2018) Massive Open Online Courses: Design Strategy & Innovation Through Design NSW Department of Industry launch; NSW Department of Industry, Sydney, Australia. Knight E (2018) How can diversity of thought help us meet customer needs and solve challenging business problems? Women in Reinsurance (WiRE) 'Diversity of Thought'; Women in Reinsurance (WiRE), Sydney, Australia. Knight E (2018) Challenges publishing novel methods in top-tiered journals, Advancing SAP Research - an interactive workshop for doctoral and early career researchers 78th Annual Meeting of the Academy of Management (Aom 2018); Academy of Management, Chicago, USA. Knight E, Le J, Stanske S, and Wenzel M (2018) Theorizing process research: Perspectives in conversation, AOM Symposium 78th Annual Meeting of the Academy of Management (Aom 2018); Academy of Management, Chicago, USA. Knight E, Wojcik D, and O'Neill P (2018) Dynamic Global Production Networks: a practice theoretical perspective of network-ing in a financial services supply chain Utrecht University School of Economics; Utrecht University, Utrecht, The Netherlands. Knight E, Paroutis S, and Heracleous L (2017) Visual Control: how PowerPoint use influence the strategy process 33rd EGOS Colloquium: The Good Organization; European Group for Organizational Studies (EGOS), Copenhagen, Denmark. Knight E, Wojcik D, and O'Neill P (2017) Visible Presence: how fintech firms internationalize Association of American Geographers (AAG) Annual Meeting 2017; Association of American Geographers (AAG), Boston, United States. Wojcik D, Knight E, and Pazitka V (2017) Investment banking centres since Lehman Brothers Association of American Geographers (AAG) Annual Meeting 2017; Association of American Geographers (AAG), Boston, United States. Knight E (2016) Incorporating lower level managers' reflexivity into organizational ambidexterity 76th Annual Meeting of the Academy of Management; Academy of Management, New York, United States. Knight E, and Grimes M (2016) CEO sensegiving and legitimacy projection across multiple strategic change episodes (Awarded 2016 Best Paper Award in Strategizing Activities and Practices Interest Group) 76th Annual Meeting of the Academy of Management; Academy of Management, New York, United States. Knight E, and Paroutis S (2016) Orchestrating Noise: Paradox Recognition in a Media Organization 36th Strategic Management Society (SMS) Annual International Conference; Strategic Management Society, Chicago, USA. Knight E, Paroutis S, and Heracleous L (2016) A Visual Approach on Strategy: The Visual-Talk Interplay in Powerpoint 30th Annual Australian and New Zealand Academy of Management Conference (ANZAM 2016); Australia and New Zealand Academy of Management (ANZAM), Brisbane, Australia. Knight E, and Meade J (2015) Managing Productivity in the Infrastructure Sector: a Case Study from Indonesia Economics and Finance in Indonesia/Ekonomi dan Keuangan Indonesia, 61 (3), 214-222. Knight E, Cutcher-Gershenfeld J, and Middleman B (2015) The Art of Managing Complex Collaborations MIT Sloan Management Review, 57 (1), 16-19. Knight E, and Hall R (2015) The role of experiential learning environments in developing paradoxical leadership 75th Academy of management conference, Vancouver, British Columbia, Canada. Knight E, Sturdy A, and O'Mahoney J (2015) Strategy as structuring? CSO occupational backgrounds and agency in corporations 31st EGOS Colloquium: Examined Life - Reason, Reflexivity and Responsibility; European Group for Organizational Studies (EGOS), Athens, Greece. Wojcik D, Knight E, and Pazitka V (2015) What turns cities into financial centres? 4th Global Conference on Economic Geography (GCEG); Global Economic Geography, Oxford, United Kingdom. Knight E, and Wojcik D (2015) International Competitiveness of Australia's Financial Services Sector: Fulfilling the Mandate of the Financial System Inquiry. Wojcik D, Knight E, and Pazitka V (2015) What turns cites into international financial centres? ; The Centre for International Finance and Regulation, Sydney, 1-37. Knight E, and Sharma R (2014) Retooling in-house investment teams inside institutional investors: three perspectives on the shift towards direct infrastructure investment Alternative Investment Analyst Review, 3 (3), 10-17. Cutcher-Gershenfeld J, Mittleman B, and Knight E (2014) Pre-competitive Institutional Arrangements in the Biosciences 66th Annual Meeting of the Labor and Employment Relations Association; Labor and Employment Relations Association (LERA formerly IRRA), Portland, United States. Knight E, and Cuganesan S (2014) The Role of Top Management Teams in Enabling and Sustaining Contextual Ambidexterity 74th Academy of management conference; Academy of Management, Philadelphia, PA, USA. Knight E, and Sharma R (2014) Towards a dynamic model for financial product evolution: the case of infrastructure investment Association of American Geographers (AAG) Annual Meeting 2014; Association of American Geographers (AAG), Tampa, United States. Knight E (2014) The Art of Corporate Endurance Harvard Business Review . Knight E (2014) Comment to Quarterly Essay 54: A Rightful Place: Race, recognition and a more complete commonwealth. Knight E (2014) Three Imperatives for Good Project Managers Harvard Business Review . Knight E (2013) Why We Argue About Climate Change; Black Inc. Redback, Collingwood, Australia. Knight E (2012) China’s new approach to renewable energy East Asia Forum Quarterly, 4 (4), 1-3. Knight E (2012) Reframe: How to Solve the Worlds Trickiest Problems; Black Inc, Collingwood, Australia. Knight E (2012) The Sun King The Best Australian Business Writing 2012; NewSouth Publishing, Sydney, Australia, 170-180. Knight E, and Dixon A (2011) The Role of Investment Consultants in Transforming Pension Fund Decision Making: The Integration of Environmental, Social, and Governance Considerations into Corporate Valuation Corporate Governance Failures: The Role of Institutional Investors in the Global Financial Crisis; University of Pennsylvania Press, Pennsylvania, 217-241. Knight E (2011) Comment to Quarterly Essay 42: Fair Share – Country and City in Australia. Knight E (2011) Essay: The Sun King The Monthly - June 2011 . Howes S, Downes P, and Knight E (2011) Climate Change and Fiscal Policy: A Report for APEC | Chapter 2 - The instruments: fiscal policies for mitigation; The World Bank, Washington, DC, 18-36. Clark G, and Knight E (2009) Implications of the UK Companies Act 2006 for Institutional Investors and the Market for Corporate Social Responsibility University of Pennsylvania Journal of Business Law, 11 (2), 259-296. Knight E (2009) Who is paying to de-carbonise the global economy? East Asia Forum Quarterly, 1-3. Knight E (2009) Book review of 'The crisis of global environmental governance: towards a new political economy of sustainability', Jacob Park, Ken Conca and Matthias Finger (Editors) International Affairs, 85 (1). Knight E (2009) The role of asset consulting companies in transforming investment decision making: the global financial crisis and the challenge of responsible investment Elfenworks Centre for Fiduciary Capitalism conference (FIDCAP 2009); St Mary's College of California, California, United States. Knight E (2009) The economic geography of carbon trading oikos / PRI Young Scholars Finance Academy Conference 2009, Gais, Switzerland. Knight E (2009) The economic implications of carbon trading across geographies European Association of Environmental and Resource Economics, 17th Annual Conference; Vrije Universiteit Brussel, Amsterdam. Knight E (2009) The role of non-financial considerations in the finance sector: the role of asset consulting companies 2nd Annual PRI Academic Conference; Principles for Responsible Investment Academic Network, Ottawa, Canada. Waygood S, Hilton P, McQuillen M, Joly C, and Knight E (2009) Fiduciary Responsibility | Part II: Survey of investment management consulting firms on the integration of ESG into the investment process; United Nations Environment Programme Finance Initiative, Geneva, 32-46. Knight E (2009) "The post-20I2 international financing framework: the path for Indonesia", Indonesian Ministry of Finance at invitation of World Bank, Jakarta, 20 April 2009..
Knight E (2009) "Comment on Pan, J. Chen, Y. Wang, W. (2009) China's Carbon Budget Proposal and the International climate negotiations", Chinese Academy of Social Sciences. Crawford School of Economics and Government, ANU, Canberra, 14 April 2009..
Knight E (2009) "Remaking the financial model: corporate finance and climate change", Oxford Achilles Working Group on Corporate Social Responsibility presentation at Said Business School, Oxford, I 8 February 2009..
Doornbosch R, and Knight E (2008) What role for public finance in international climate change mitigation? Round Table on Sustainable Development, 3, 1-41. Knight E (2008) Using private law remedies to turn corporate values into climate change solutions 38th St. Gallen Symposium; International Students' Committee (ISC), Gallen, Switzerland. Miller M, Wilder M, and Knight E (2008) Legal Issues and Contractual Solutions for LULUCF Projects under the Clean Development Mechanism Climate Change and Forests: Emerging Policy and Market Opportunities; Brookings Institution Press, Baltimore, United States, 163-176. Doornbosch R, and Knight E (2008) Discussion Paper: What Role for Public Finance in International Climate Change Mitigation; Organisation for Economic Cooperation and Development (OECD), Paris, 4-41. Stakeholder perceptions of cybersecurity risk within Department of Defence Chief Information Officer Group (CIOG) based on training tool intervention; Client Commissioned Research. Unlocking innovation within the workforce: Understanding workforce contribution to innovation and enhancing the effectiveness of innovation programs within the Department of Defence Chief Information Officer Group (CIOG); Client Commissioned Research. Australian Agriculture Industry Research Report; Client Commissioned Research. Enhancing the effectiveness of cyber security educational content delivery within the Department of Defence Chief Information Officer Group (CIOG); Client Commissioned Research. Design Strategy: Design thinking for business strategy and entrepreneurship; NSW Department of Innovation, Boosting Business Innovation Program. Australia's role in Global Financial and Production Networks; Australian Research Council Discovery Grant. International competitiveness of Australia’s financial services sector: fulfilling the mandate of the Financial System Inquiry; CIFR Research Project. Carbon market creation and development in Southeast Asia; SSEAC Publication Grant 2013-2014. The Australian published an article by Pro-Vice-Chancellor (Research – Enterprise and Engagement) Associate Professor Eric Knight about the changing nature of university education. Business Insider quoted Pro-Vice-Chancellor (Research – Enterprise and Engagement) Associate Professor Eric Knight from the Business School about his research into the communication style of US President Donald Trump’s tweets. The growth in Chinese student enrolments in Australian institutions of higher education offers a once-in-a-lifetime opportunity to build strategic ties in the region. But recent debate suggests that political and business leaders don't necessarily appreciate the nature of the economic opportunity. The NSW government is supporting the University of Sydney to deliver two free online courses to help businesses and entrepreneurs embrace innovation and grow through design thinking. In corporate Australia's ongoing debate about the diversity and experience required of its directors, one perspective has gone unremarked: their connection with universities, or lack of it. Dr Eric Knight's latest book, Why We Argue About Climate Change, takes on one of the most contentious policy issues in Australia and in international politics. He discusses what he believes to be at the heart of the debate, and the critical role of entrepreneurs and small businesses in the solution.